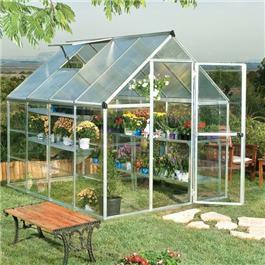 6 x 4 Green Aluminium Greenhouse. The BillyOh Greenhouses – 5000M Easy Fit Aluminium Green Framed Polycarbonate Greenhouse Including Greenhouse Base and Opening Vent, is a great addition to any garden, new improvements have made assembly a simpler process, whilst the powder coated frame ensures rust resistance, requires no maintenance and offers a great finish. This hybrid design combines twin walled polycarbonate panels in the roof for added strength and heat retention with single walled polycarbonate glazing in the walls to give balanced sunlight exposure during the day. Furthermore, these panels are 100 UV protected so will not turn yellow after prolonged exposure. 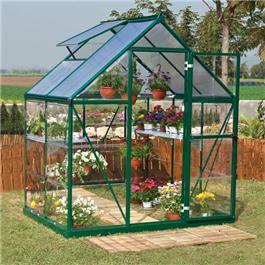 Easy to erect this greenhouse has been constructed using a new easy fit design, it uses a simple slot and slide design which requires no fixing clips and holds the glazing in place this also helps prevent panels blowing out. Manufactured by BillyOh.com.